EAW004386 ENGLAND (1947). Beyer, Peacock and Co Gorton Foundry, Manchester, 1947. This image was marked by Aerofilms Ltd for photo editing. Title [EAW004386] Beyer, Peacock and Co Gorton Foundry, Manchester, 1947. This image was marked by Aerofilms Ltd for photo editing. 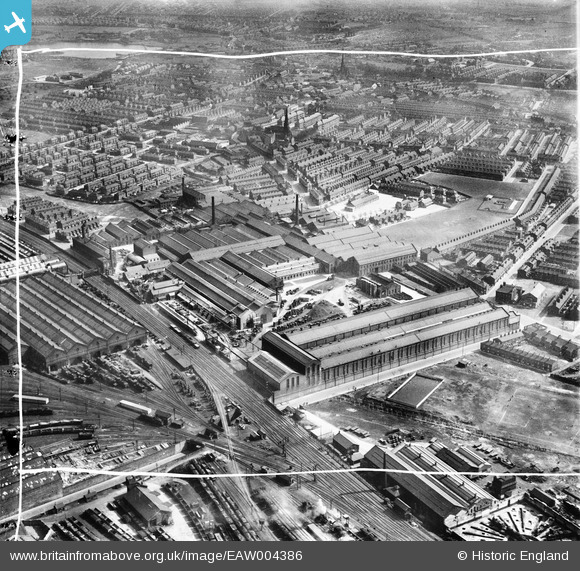 Probable location of the buildings associated with the WW2 HAA Gun Battery at Levenshulme, designation E/-. Diamond crossing trackwork, by the different coloured ballast to be seen, this has just been removed. St James (formerly St Thomas, formerly St James) - current building financed by Mr Beyer.